As 2019 begins there have been many changes taking place within the local and national economy. Of these changes includes the regular session for local legislators. The Henderson County Partnership for Economic Development invited local legislators Senator Chuck Edwards and Representative Chuck McGrady to the Henderson County Historic Courthouse on January 15th to answer questions and give insight to our top investors into what 2019 may look like for Henderson County and the state of North Carolina. Moderator: What are you specifically focusing on this year in terms of legislation and committees? Senator Chuck Edwards (CE): Our agenda is driven by the budget, but our state revenue numbers are not looking good and we need to work on that. We need to take better care of state employees, our teacher’s salaries aren’t where we want them to be yet, but other state employees need to be taken care of as well. School safety is also a priority that we want to put on the agenda. Representative Chuck McGrady (CM): It’s too early, the speaker says we will have a school construction bond and I expect that to be on agenda, one of the things I’ll work on is to move towards non-partisan redistricting, I’d like to see us get to a different place with that. Assuming I’m still chair of the Alcoholic Beverage Commission, I’ve done a lot of work for the craft beverage industry and now I’d like to focus on distilled spirits, I don’t think the state should be in the business of selling alcohol. Most of my work will be with the Appropriations Committee, high on the list would be a Western Carolina medical school. The WNC Ag Center and Farmer’s Market, Dupont State Forest- these are among things we need to make sure are adequately funded. We also need to make sure transportation funding is still on track. Moderator: How does the 2020 Presidential and State elections impact decisions in the coming year? CE: It’s not going to have anything to do with how we represent you in Raleigh. My eyes will be on District 48, I’ll fight like mad to represent you and to protect our quality of life. CM: We’re going to see some rhetoric bleeding into what’s going on. I don’t know what lies ahead in that regard, but when it comes to any one bill, it’s not going to change our priorities. 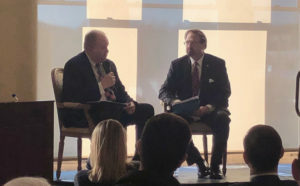 Moderator: What legislative changes in 2019-2020 would you keep your eyes out for that might impact NC employers from an administrative, insurance, labor or compliance perspective? CE: We want to add some clarity to further protect employers. There is some gray area in workman’s compensation laws created in the previous administration that we hope to address – changes that will favor employers. We also want to look at insurance law coverage, the way agents handle business and report back to the Department of Insurance. Hopefully this will lower rates. Moderator: The Economic Development Partnership of North Carolina is the lead generator for the State. The majority of the leads/projects that the Henderson County Partnership work on come from this group. Do you believe the current EDPNC structure will sustain? What does the future of their relationship with Commerce look like? CE: The easy answer is I’m going to ask you what it should look like. There should be some central force in NC, particularly for international companies looking to enter the US… we need a first point of contact. EDPNC can raise and spend funs in a way that state government cannot, particularly for marketing. There should be an entity that can perform those services, if it’s not EDPNC, what should that entity be? Moderator: The Tier System continues to be a battle across the state. Henderson County is deemed a Tier Three, or one of the top twenty most prosperous communities in the State. This assumption prevents us from many resources. Will this session address this issue? CM: The Tier System used to have one purpose, but now it has like 12 purposes. I think there is broad swath of legislators that think the Tier System is a blunt tool to deal with county differences. The system is not working in my opinion and I would be very supportive to move towards something else. CE: There have been preliminary discussions about putting this on the agenda in a big way. I feel confident that we can take it up. I will say that this is a subject that is so huge and broad, I would be surprised if we came up with a product in one session. I don’t believe it should be eliminated, there are a variety of programs in North Carolina with appropriations based on the Tier System so in many cases we have decided that we need some system to distribute funds, but one that better represents conditions in our counties. This is one of the things that is on the top of my agenda. Moderator: What is North Carolina’s Achilles Heel in attracting new investment and job creation? CE: Here’s an example: we just put out a billion dollars for disaster relief that wasn’t budget affected. Most states couldn’t do that. I’m not sure we have an Achilles Heel either, we are rather competitive. Moderator: What does the State do well in economic and business development and what can we do to improve our competitiveness (locally and state level)? CE: We are the envy of many states. The community college and university system we have are the cream of the crop, wherever you live you in the state you are 30-minutes from a community college. We also have incredible infrastructure; our airports and highways are great. We are also looking to reduce our regulatory and tax climate, you’ve seen bills come out of recent sessions doing this and I think you’ll see more soon. In terms of doing better – we need to fund our community colleges and bring our high school students into synch with our universities and community colleges as they prepare for career readiness. I also think we can improve in higher technology. There’s no reason why we shouldn’t have a Silicon Valley in North Carolina. I believe that we may very well be able to birth a technology center in the mountains. CM: Our population is continuing to grow, and what I really look for out of local government is that we’ve got to try and work together on some of the projects funded by the State. We look towards local government to set those priorities – we need to interact better on transportation and education priorities. Moderator: The Asheville MSA has continually had one of the lowest unemployment rates over the past twelve months. Buncombe County had the lowest in the State and Henderson County had the fourth lowest in the State. This certainly creates challenges with finding people to fill jobs in our growing economy do you foresee any increased funding to help support and strengthen NC’s public schools and community colleges in the coming year? Customized training? CE: Easy answer is yes. We spent $1.5B more than we did last year, and I believe there is a general commitment in the NGCA that we need to further invest in our school system and elevate our prioritization of the community college system. Moderator: Are Henderson County/regional transportation projects still on target to receive funding and have any schedules changed? CM: Yes, the schedule is still on target and… yes, the schedule has changed as is routine, they always change. The challenge is we are growing; any local officials knows how hard it is to move forward on a project. In the long term, our state’s challenge is transportation funding. We have to come up with broader mix of revenue sources to fund transportation projects. Moderator: What do you think are the most important challenges that residents of Western North Carolina face as our community and region continues to grow? How are those challenges being addressed in Raleigh? CE: I believe that folks in WNC want to be left alone- allowed the opportunity to get a good education for their kids, so that they have a reasonable shot of landing in the middle class. I feel like we’ve created a climate for that. We just want a fair shot. CM: This is hard for us because our hospitals and schools are top notch. We’ve got infrastructure, we’ve got an airport and I-26, and local leaders always looking to get ahead of the curve. This is a hard question, not because there aren’t things that needs to be done, but we read that our constituents are happy. Trying to bring our kids back home is a real issue… and this is place where people want to live, so we just need to stick to that plan. Moderator: We all know Henderson County is the best county in the State. When you walk the halls of NCGA, what are people most jealous of in our community? CE: They’re most jealous that we’re in Henderson County and they aren’t. We’ve got it all: great utility cost, healthcare, transportation, natural resources, strong tourism, we have absolutely got it all. Biggest challenge is keeping it and continuing to direct resources to our community. CM: We’re a hot spot right now- its Western North Carolina- but Henderson County in particular has great state parks, people love our beer, love our rivers, our bed and breakfasts, our colleagues just face problems that we aren’t trying to solve. But we’ve got to focus on not getting left out on school bonds and Tier Systems because we have our act together. We don’t create a disincentive to invest here.